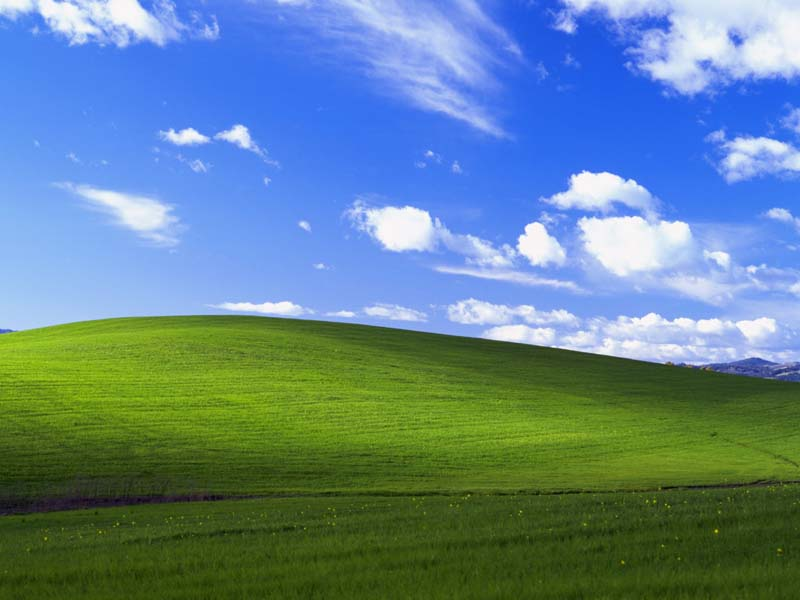 So you've got the latest Android or iPhone. Are you still fumbling around looking for an open wifi to leech from? Are you limiting your phones potential to just stationary hotspots? 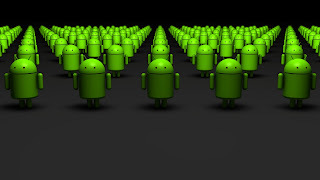 Since the introduction of the iPhone, smartphones have been gaining popularity. 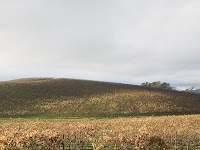 Similar to the "Starbucks Effect", Apple has made mobile computing accessible to the average consumer. Now, let's unleash the full potential of your smartphone by keeping it online! Most people (Including myself) have had horror stories of stratospheric data charges just by leaving the mobile data feature on our phones on. I've since then, switched to an unlimited data package which has been such a sanity saver when stuck in traffic. But to most people, an unlimited data package isn't cost effective, or even necessary. So where does that leave the average consumer? Someone who just wants to check their email every now and then. Maybe check on movie schedules once a week. Or check the traffic situation after work? Enter the tiered data packages. I can't speak for the other carriers (I'm hoping some of my readers will chime in with their respective carrier's offers) except for the 2 major ones in the Philippines: Globe Telecom, and Smart Communications. Even though I'm on unlimited data, I still log my data usage using Call Meter NG. And I average about over 500MB/month on my phone. This is inclusive of all the downloads and tethering I do. I'm definitely one of the heavier users. If I did not tether my laptop, and didn't upload photos and video through my phone, I would probably average about 100MB/month. If you're a heavy user and tether your laptop, tablet, and other devices to your phone a lot, get the unlimited plan. If you're a heavy user, but only need mobile internet less than 8 days a month, get an unlimited/day use. 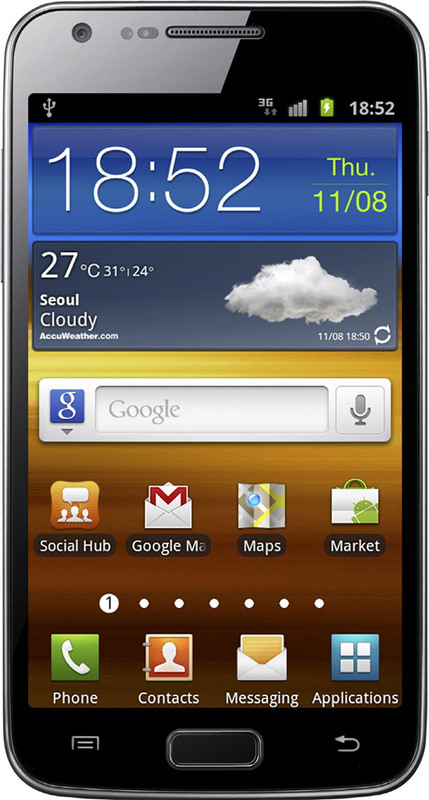 Samsung has just announced an LTE version of their Galaxy S II. No official announcement on availability date, or price. Maybe Smart can offer this with their LTE service? Apparently, Steve Jobs meant to say "I reign as CEO of Apple"
Thanks to masseur from Esato for this. I'm really not fond of tech companies mud-slinging... patent disputes, legal battles... it all hampers development and innovation. But alas, companies are more than their products & services. Enter the latest in the Philippine Telco News... The Globe Tattoo Lamborghini Stick Scandal. 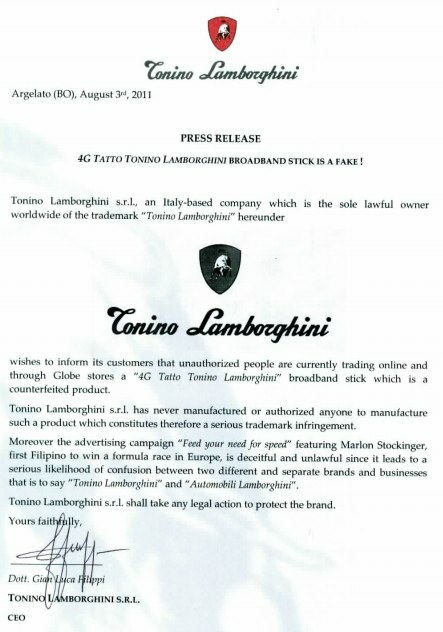 Last Aug 3, a signed letter from the CEO of Tonino Lamborghini (The lifestyle/design company, not to be confused with the Automobili Lamborghini that makes the kick-a$$ cars, whose logo is yellow, instead of red) was released stating that Globe Telecom had no rights to use their trademark name and logo. Globe Telecom obtained authorization to use the name and logo Tonino Lamborghini through an agreement with Primo Mobile, the master franchisor of mobile phone related products for the Italian brand Tonino Lamborghini. Primo Mobile is a Singapore-based company that has a master license agreement with Tonino Lamborghini s.r.l. and is duly authorized to sub-license the use of the Tonino Lamborghini logo. The design of the Globe Tattoo Tonino Lamborghini 4G broadband stick was reviewed and approved by Primo Mobile. Globe Telecom assures the public of its strong adherence and commitment to the highest ethical standards in business and good corporate governance. The company will not engage in any activity that will mislead the public in the course of doing business and serving its customers. Ok, granted this may have been a miscommunication between Primo Mobile and Tonino Lamborghini and the rights to sub-license the brand. But from a branding stand-point, it is a bit deceiving. It's pretty much like the Ferrari & Porsche phones and laptops which do not reflect the performance, nor the exclusivity, of the respective car brands. Lamborghini shouldn't have given Primo Mobile sub-license authority if they can't monitor the companies that are being given use of their trademark. And Primo Mobile should be diligent in reporting any and all trademark users back to Lamborghini. Either way, I think Globe paid uselessly for the name, when it makes no sense to be associated with a lifestyle brand that makes watches and bed linens... I think Alessi or S+arck would've been a better choice if class and lifestyle was really their intention... unless they wanted to be mistakenly associated with the car brand. Tonino Lamborghini Group wishes to clarify that Primo Mobile had been granted only a trademark license - neither a master license nor a master franchise - but such trademark license agreement was duly terminated by the licensor, Tonino Lamborghini s.r.l., some months ago. 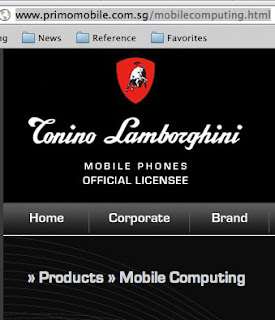 In any case, such trademark license agreement did not authorize Primo Mobile to sub-license the use of the Tonino Lamborghini trademark and logo. 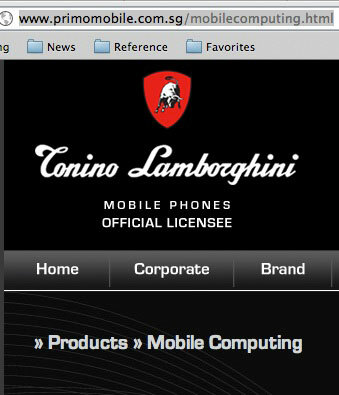 If this is true, then why does Primo Mobile's website look like an official Lamborghini site? I think Lamborghini should review all the licenses it gives out. 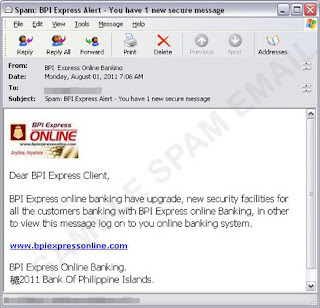 Looks like both Primo and Globe are in deep trouble. 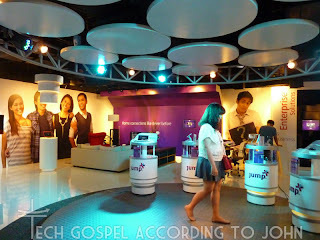 Smart and PLDT have set up a new customer center called "jump" in Megamall. 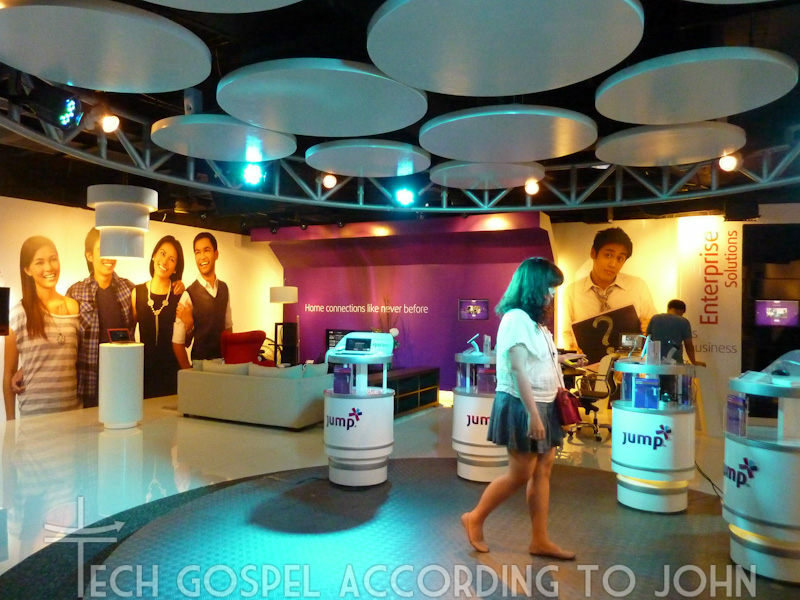 This showcases current and upcoming telecom tech in the Philippines. Customers are allowed to play with gadgets and test them out. Outfitted with touchscreen tables and some of the latest gadgets, gadget lovers would enjoy coming here. 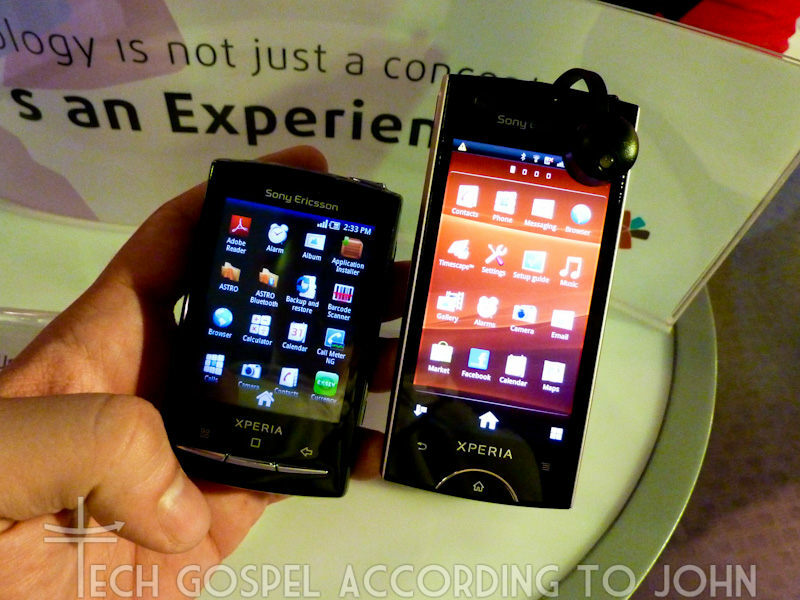 It even showcases some phones (such as the SonyEricsson xperia ray) that are not yet on the market. Drop by! 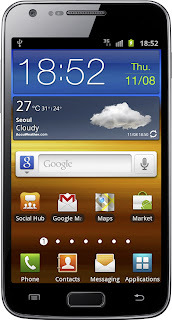 Google has gone shopping for a mobile phone... and it has decided to buy Motorola. A total sum of US$12.5 Billion was paid for the mobile phone division of Motorola... which I'm guessing also includes a healthy patent portfolio or at least a lot of access to certain technologies. This instantly bumps Google up to the #8 spot as a mobile phone manufacturer, aside from being the #1 Smartphone OS provider with Android. I wonder what will their new division be called? Hahahahaha! 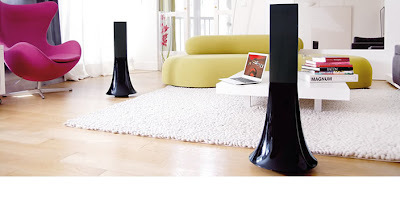 Parrot by S+arck: These are one of the nicest looking compact home speakers available. Technology used are a couple of NXT (now Hi-Wave) panels that handle the high frequencies, and a couple of downward firing subs under each speaker. The system is wireless and powered. Each speaker needs to be plugged into a wall outlet to supply the 50watts per channel. The system does not work individually, since the control panel is on one speaker, and the iPod dock is on the other. The pair also accepts audio via Bluetooth but reliability drops off beyond 2m every now and then so the iPod dock would really be the way to go. Wifi audio streaming is much more reliable. The remote operates over RF so line-of-sight is not critical for operation. The set comes in a really cool carrying case that looks like a trumpet bag... although I don't really see people lugging this set around after initial setup. They are light enough to carry around from room to room. The Parrot is perfect for art/design oriented people that want a simple, all-in-one system for a small room or apartment. Although loud enough for large rooms, anymore than 15 people and the sound gets drowned out quite quickly. They make great conversation starters and center pieces for room decor. On the audio quality, they sound ok. Not bad. Do not think that these are speakers that happen to look nice... these are decorative pieces of furniture that happen to make sound. I was disappointed however with their overall height. When I first saw the pictures, I was expecting them to be at LEAST 1m tall... but they're only .75m and this doesn't really maximize the potential range and dispersion of the sound. Forget left-right directionality since the natural dipolar properties of NXT panels creates a nice diffused sound field that has a better ambient mood than traditional speakers. These will most likely be used in a living/dining room or casual area where conversation will take priority over sonic accuracy. I wouldn't recommend these for listening rooms, or home theaters. At Php88,000 (or US$1,600 abroad) they're cheap for an art piece, but not cheap for speakers. If you consider that you're getting 2-in-1 then it's a pretty good deal. Although the technology for air-powered engines has been explored by others throughout history (First recorded air-powered vehicle was in France in 1840) Tata's air-powered car is the first to bring this tech within reach. The engine in use was developed by Ex-F1, Ex-Renault engineer Guy Nègre for the MDI Group. Aside from being eco-friendly, the Air Car has a range of about 200km per air refill (cost of an air-refill is approx US$2) making it practical for everyday use. A small electric compressor may be added to the car to allow convenient refilling from your home outlet in 4 hours, or it may be filled by an industrial air compressor in 3 minutes. Since there is no combustion to burn the internal lubricants, oil changes are only needed every 50,000 km or so, and it uses vegetable oil for mechanical lubrication. The most interesting trait of this engine is that its exhaust is COLD air, negating the need for an air-con system all together. Exhaust air from the engine is 0-15 below zero. If manufacturers (nudge, nudge...BMW-i ... nudge, nudge...) use this engine in their upcoming hybrids, the exhaust gas alone is enough to replace the entire Li-Ion battery cooling system and air-con system. And extend the range of any electric car by providing an on-board generator that's way easier to refill than a petrol car. 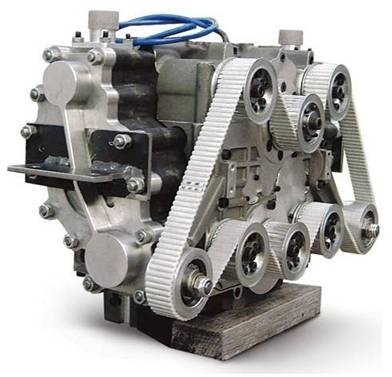 Although the torque generated is quite low, it's more than enough to act as an electrical generator to recharge the Li-Ion batteries in upcoming electric cars, lowering their over-all carbon footprint. Tata plans to sell the Air Car in India for approx US$8000 within the year. 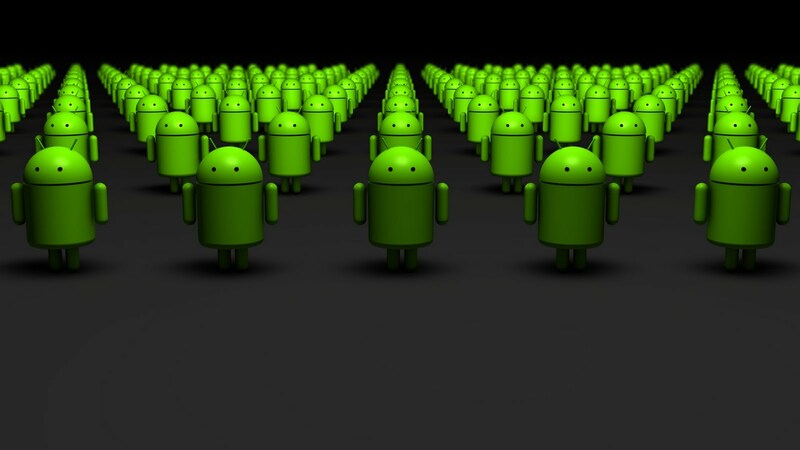 In a recent report by Canalys, Android's Smartphone marketshare has jumped up to a staggering 48%. iOS comes in 2nd at 19%. Apple still hold the #1 spot for leading smartphone vendor at 19% as well, since Android's marketshare is divided among all Android vendors. RIM is down to 12% from last year's 33%.